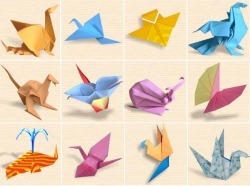 Origami (from oru meaning "folding", and kami meaning "paper") is the traditional Japanese art of paper folding. The goal of this art is to create a representation of an object using geometric folds and crease patterns preferably without the use of gluing or cutting the paper, and using only one piece of paper. Origami only uses a small number of different folds, but they can be combined in a variety of ways to make intricate designs. 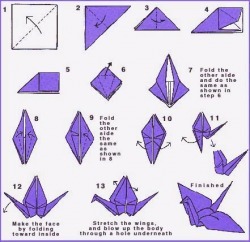 The most well known form is probably the Japanese paper crane. In general, these designs begin with a square sheet of paper whose sides may be different colors or prints. Contrary to most popular belief, traditional Japanese origami, which has been practiced since the Edo era (1603–1867), has often been less strict about these conventions, sometimes cutting the paper during the creation of the design.